I thought today would be a great day to share what we are doing in the Crafting For Animals Guild on Artfire. This event will take place during the entire month of October, in part to celebrate adopt a shelter dog month as well as to raise awareness and funds. We will have new daily blog posts about dogs and pets (I will be contributing two posts, maybe more.) And we'll be doing some extra tweeting, promoting, and what not. The best part of all is during the last week of October we will accept the above coupon code in our shops. 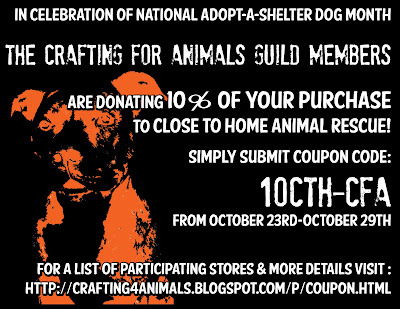 When you use this coupon, the shop owners promise to donate 10% of the purchase price to the Close To Home Animal Rescue group. So, please go to our blog site and check out the shops that are participating in this fund raising effort. This would be a great opportunity to start your Christmas Shopping as well! Thanks for sharing about the Crafting for Animals Guild. I'm browsing through all the shops and saving my purchases for the last week of October. The Close to Home Animal Rescue is a small organization that takes in animals and fosters the pets while they look for great homes for them. Nicely done! October will be exciting. Hope we can all share this information with a multitude of people to create awareness for helping the shelter dogs and cats find forever homes with loving people. I am so excited about this October Promotion, ladies! I really hope we have a good turnout in participation and customers!